"An eye for an eye... a piece for a piece." 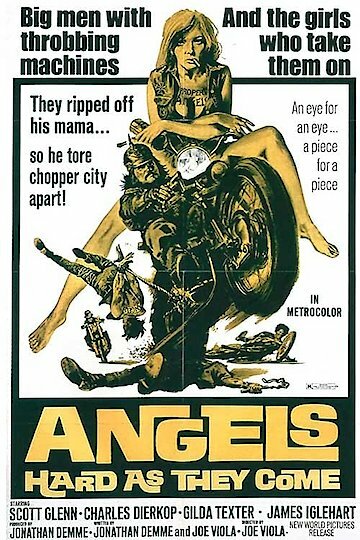 In this action thriller, two biker gangs, The Angels and The Dragons, are attempting to finish a botched drug deal out in the woods. The Dragons have invited The Angels to a party where there are also a lot of cool hippie women. Everything is fine until one of the hippie girls is murdered. The deranged leader of the Dragons, a dwarf, and his well-built minions are convinced The Angels did it, and the psychotic leader is determined to make them pay. Angels Hard as They Come is currently available to watch free on Tubi TV and stream, download, buy on demand at Amazon Prime, FlixFling VOD, Amazon online.